To introduce the non-mathematical reader to the subject, the first chapter is rather light-hearted. It presents some traditional stories from Central Africa, but confined to astronomy, because this domain is important for the interpretation of the Ishango rods as moon calendars. 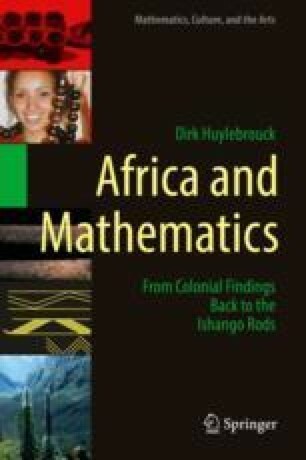 The structural elements of African music, discussed in the second part of the chapter, are emphasized because of their importance for an interpretation of the carvings on the Ishango rods as an arithmetic game, as it shows analogous doublings and additions as in African music.